Energy-as-a-service is the newest entrant to the as-a-service business model, and it is redefining how businesses think about their relationship with energy. Energy-as-a-service delivers value at scale. It not only curbs one of business’ biggest operational costs – energy - but uses energy infrastructure to drive value, even as needs change over time. Read this insightful whitepaper to learn how energy-as-a-service is the key to unlocking other benefits beyond energy, providing a compelling way forward. It addresses questions like: How leveraging multiple technologies makes as-a-service solutions appealing? What are the ways in which the companies are changing their relationship with energy in the new energy-as-a-service model? How the growth of as-a-service models is setting the stage for companies to improve how they think about energy use? 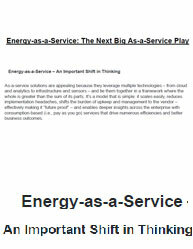 It’s time for energy-as-a-service!!! Creating a Smart District Heat Network is far from simple, and requires input not only from heating experts, but also from IT specialists and financial consultants. Between integrating renewable energy resources into existing systems to using information and communication technology, district heat operations are set for change. In this informative paper, innovative technologies and advanced system concepts in district heating are described for heat distribution and end user utilization. It aims to provide background materials and cutting edge knowledge for designers and decision makers in the building and district energy sector. 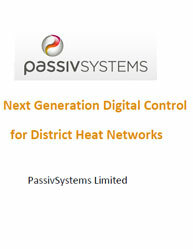 What are the requirements of a smart heating control system for district heat networks? What is the role of district heating in future renewable energy saving? What are the benefits of having a smart District Heat network? What is the average cost of heat for the range of district heating options and stand-alone renewable heat technologies with electric and gas heating? How return on investment in a district heat network can be improved? Read this whitepaper that highlights a next generation heat network modeling and optimization platform that improves performance, delivers annual OPEX savings, and empowers customers. Embracing the Challenges of Broadband Energy Crisis Key components to improve energy efficiency are technologically advanced and more efficient power supplies that can help in reducing energy consumption . Even though the broadband industry is largely focused on the rapid global expansion of broadband networks and its offerings, growing broadband energy consumption has not gone unnoticed. 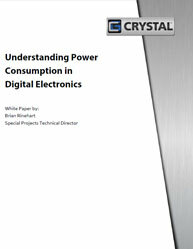 This whitepaper on ''Broadband Energy Crisis'' covers: Growing Demand to manage Energy Crisis: Decreasing energy consumption and energy costs Improving Line Efficiency: Reduce energy waste to improve energy efficiency Output Voltage and Regulation: To reduce network cable loss Improving Inverter Efficiency: Increases battery run-time and reduces battery string count Power Supply Monitoring: Optimization of the power supply and the broadband network Read this insightful whitepaper that brings you the ways to improve energy efficiency and embrace the challenges of broadband energy crisis.